Better at room temperature than warm, these carrots are perfect for summer entertaining--a make-ahead dish full of earthiness, creaminess and crunch. 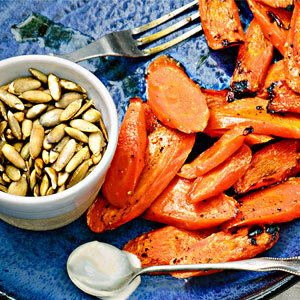 In a small oven-proof skillet, toss pumpkin seeds with remaining 1 teaspoon oil. Season with a pinch each of cumin, salt and pepper; toss to coat. Place skillet in oven during last 10 minutes of carrot roasting time to toast. Transfer to a paper towel-lined plate; cool.